I must admit, it was a brave effort, he almost did it. Unfortunately, there are two T letters in the Hebrew language and this guy chose the wrong one. The word does have a meaning, just not the intended one. It can be read as "Shiteph" (shared) or "Shutaph" (partner). All the meanings derived from this word are sharing related, they have nothing to do with washing. You are correct: things could be lots worse for this 'victim'. I'll have one of my 'heverei' squeeze him a bit on the bad-tat, till he agrees to sing about, oh, who the Pope has in line next for saint-hood. A year of no problems and he gets a 'Mem' on the right plus a pair of yuds in the middle. Of course he'll need a new ID, but he may already be thinking about that. You're not a native Hebrew speaker, are you? Every Israeli will read שתף as SHATEF - meaning "share" in imperative. Which is lovely nontheless. He orders people to share him around. We just need more girls with this tattoo. Anyway, about that girls remark, I have something coming up tomorrow that will be right up your alley. Do stick around! The answer to the riddle is that there are (at least) as many interpretations as there are "native speakers" Absent any vowels or context, all I saw was a shoresh, a'luv ve' mis'khen. If the sucker meant a command, well, exclammation points are 50c a piece. 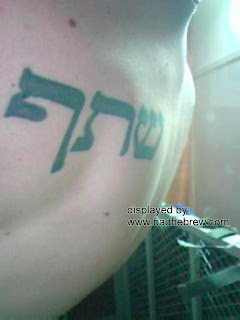 And I'm still convinced this was shlab aleph of an eventual 'shatef peulah' (collaborator) tattoo. Plenty of space left on his/her back. Haha, nobody else read this as the slightly-misspelled Yiddish word Shtup?! I personally like the שתף better than שטף. More meaningful in my opinion. Course I can't speak for the guy who got the tattoo.